With the Brewers eliminated from postseason contention, thoughts are naturally turning to 2015. It’s as if the late-season collapse that brought the first-place Brewers to their knees hasn’t infected all their fans with endless pessimism about the future. But before we cast our eyes, gleaming with irrational hope, toward the new season, let’s stop for a second to reflect on what we’re about to lose. Rickie Weeks is a lightning rod among fans for a lot of reasons. His early years on the team were marred by low batting averages and nagging injuries. Fans were frustrated by high strikeout totals, lackluster defense, and a perceived careless approach at the plate, despite the fact that Weeks led the club’s regulars in on-base percentage in 2006, was second in 2007 and 2010 to Prince Fielder, and third in 2008 … well, you get the picture. Fan sentiment about Rickie has never actually reflected his skill set, which included a power bat not generally found in the middle infield. One thing people were generally correct about, even in those early days, was the injury bug. Weeks is basically Frankenstein’s monster. He’s had wrist surgery twice (2006 and 2009), and missed additional games because of a wrist injury in 2007. Weeks had let thumb surgery in 2005 and missed handful of games in 2008 because of a sore knee. Availability is a skill, as they say, and Weeks took plenty of criticism because he couldn’t stay on the field. Fan sentiment seemed to shift after Weeks’ first healthy season in 2010. Weeks was a dynamo for the 77-85 Brewers, playing 160 games and slashing .269/.366/.464 with 29 home runs. The potential many had talked about for half a decade had finally been realized, and the Brewers moved quickly to sign Weeks to a long-term extension in the offseason. On the eve of Weeks’ final arbitration hearing, he and the team agreed to a four-year, $38.5 million deal with a fifth-year vesting option covering 2015. Smartly, the Brewers built outs for themselves if Weeks was not an everyday player in 2013 or 2014. Unfortunately, Weeks didn’t stay healthy in 2011, and couldn’t quite replicate his success in 2012. However, he still contributed plenty to to those teams. In 2011, Weeks shredded his ankle when he landed on first base awkwardly and was limited to 118 games that year, although he still managed to accumulate 20 home runs with a very respectable .269/.350/.468 triple slash en route to his first All-Star berth. 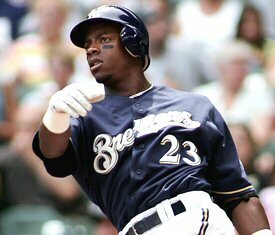 In 2012, Weeks again surpassed 20 home runs in a healthy season but hit just .230. By 2013, many were calling for Weeks’ ouster at second base in favor of the much-hyped Scooter Gennett. They got their wish when Weeks suffered a season-ending hamstring injury in August after hitting just .209. The left-handed Gennett did well in Weeks’ absence, and the two entered into a fairly rigid platoon during the 2014 season. Weeks has rebounded to his best season since 2011, hitting .272/.350/.451 with 8 home runs in 277 plate attempts. He declined to move to left field early in the season, preferring instead to market himself as a second baseman as he enters free agency after this year. The Brewers will not pick up Weeks’ option, and we are presumably watching the last days of Rickie Weeks in a Brewers uniform. Weeks is one of the last holdovers from the Brewers postseason appearances in 2008 and 2011, and has been a lineup staple since 2006. Very few players have that kind of longevity with a team, which itself speaks for Weeks’ skills. While its fair to say there is a certain segment of Brewers fans who have never liked Weeks, even they have to appreciate the 18 career fWAR he has accumulated as a member of the Brewers. In these final two games, the fans always so critical of Weeks need to step back and admire a guy that not only gave his all when able, but contributed in real, definable ways to bring postseason baseball back to Milwaukee. Aramis Ramirez may be an All-Star in 2014, and it’s pretty easy to see why. The slugging righty is currently hitting .292/.340/.492 with 10 home runs, has the second-highest wRC+ (a measure of a player’s total offensive value above league average) among NL third-basemen at 129, and he’s shown quite a capable glove at the hot corner. There are definitely other worthy candidates (Todd Frazier and Matt Carpenter, for example) but there’s no doubt Ramirez is having a great year. It seems a prudent move for the Brewers to pick up their portion of Ramirez’s 2015 mutual option. Ramirez is being paid $16M this year, but his 2015 option is for $14M, and the Brewers are already on the hook for a $4M buyout if they decline. That means the option’s net cost is $10M. If we assume the cost of a win in 2015 remains around $6M, Ramirez would only have to contribute about 1.6 WAR to be worth the money. Ramirez accumulated 5.7 fWAR during a healthy 2012 season, 1.4 during an injury-plagued 2013 campaign, and currently has 1.6 in 2014, despite missing most of May. The Brewers don’t have a lot of other third base candidates. Internally, the closest the team has to a major-league 3B is Taylor Green, who was drafted in 2005 and is already 27. Green has had an up-and-down career in the minors, but lost all of last season to a hip injury that required surgery. Green currently sports an OBP below .300 at AAA Nashville, and hasn’t hit will in limited time with the big-league club. He’ll also be arbitration-eligible for the first time in 2015. The Brewers best 3B prospect is probably Nick Delmonico, who was acquired from the Orioles in 2013. Delmonico, who currently plays for A Brevard County, will need more development in the advanced minors before he’s ready for the prime time, though. Externally, the Brewers could do a few things, but none as good-or realistic-as bringing back Ramirez. They could attempt to resign Mark Reynolds in 2015 and play him exclusively at third; this has the advantage of being relatively cheap. Despite Reynolds very good year with the glove, I’m not sure it’s the wisest choice giving Reynolds’ reputation for defensive lapses. Pablo Sandoval-the only full-time 3B free agent under the age of 30-is reportedly looking for a deal upwards of $100M and comes with health and performance concerns. If the 31-year-old Hanley Ramirez doesn’t work out an extension with the Dodgers, he too would look for a big-money deal in likely his last long-term contract. There’s Chase Headley, also 31, who may in the midst of a severe decline, raising questions about his fielding and plate discipline. Beyond those four, it’s really just a bunch of guys, the most appetizing of which may be former Brewer Casey McGehee, currently hitting .309/.375/.392 with the Florida Marlins. Of course, the option isn’t completely in the Brewers hands. Ramirez, who turns 36 tomorrow, may think he can get a better deal on the free agent market and decline his half of the mutual option (though that wouldn’t necessarily preclude the Brewers from bringing him back). Ramirez has also had lots of nagging injuries over the last few seasons. In 2013, he missed time during both spring training and the regular season with knee issues, and a hamstring strain this year cost Ramirez almost all of May. He left the game last Saturday with back tightness. The injuries cut both in favor and against the Brewers: they might scare off a few teams from a long-term deal and lower Ramirez’s market value, encouraging him to exercise his half of the option (resulting in the $4M buyout if the Brewers elect not to do the same). On the whole, it seems that barring some catastrophic injury, the Brewers best plan for competing in 2015 might be to pick up Ramirez’s option and hope he reciprocates. His big bat won’t be matched by any internal candidates, and the external candidates who could perhaps contribute equally will cost much, much more. Even if Ramirez is true to his history and suffers some minor injury during the 2015 season, his expected contributions during healthy periods make it a worthwhile gamble. I’ve watched a lot of baseball, but I don’t think I’ve ever seen anything quite like what happened in the 7th inning of yesterday’s 5-4 loss to the Atlanta Braves. The wheels started to fall off a quality start for Matt Garza when, with the Brewers up 4-2, he allowed a pair of singles to start the bottom of the inning. Garza departed with one out, and Brandon Kintzler was summoned to face righty Gerald Laird, who hit a ground ball to third that deflected off Mark Reynolds’ glove and trickled into left to score Chris Johnson. That’s when things took a decidedly damning turn for Ron Roenicke. 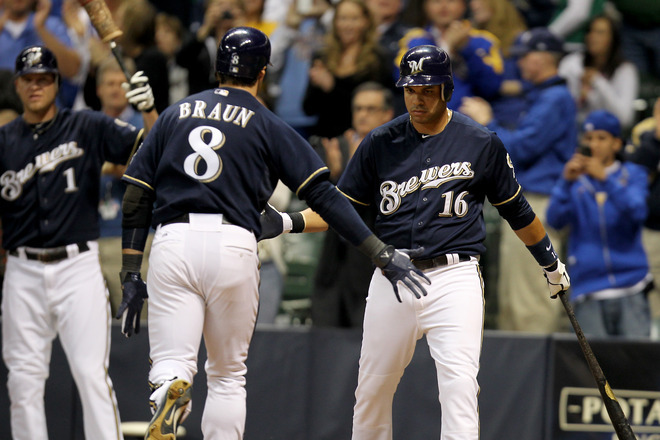 With Ryan Doumit batting, Roenicke summoned a lefty … only none had been getting loose. 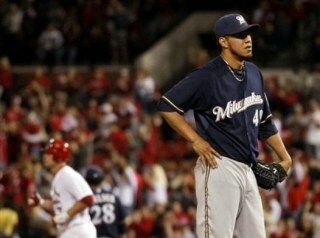 When Roenicke walked out to the mound, the bullpen was visibly panicked. Zach Duke wound up emerging from the gates, but Roenicke had already made the substitution for Will Smith. So Duke returned to the bullpen and the cold-armed Smith took the mound. Braves manager Freddi Gonzalez insisted on adherence to the eight-pitch rule, and that’s all the warming Smith was able to do. Home plate umpire Fieldin Culbreth was so concerned about the potential for injury that he tried to bend the rules and get Smith more warm-up pitches. He even initiated a psudo-replay review to see if there was any way to help Smith, but nothing could be done. And that falls squarely on Ron Roenicke. The results were predictable, and as Rock said on the broadcast, Smith showed all the signs of coming in cold. Smith allowed back-to-back singles and walked the third batter before being lifted. Roenicke compounded his bullpen mismanagement by bringing the infield in with only one out and the go-ahead run on second, and the Braves took a 5-4 lead on the first single. While the situation provides an interesting glimpse into the daily work of the pitching coach and the importance of his relationship with the manager, the failure to get it right in this case is utterly inexplicable. There are monitors showing a feed of the bullpen in the Atlanta dugouts. There’s a phone in the dugout with a direct line to the bullpen. And it’s apparently pretty easy to send someone to personally check on the bullpen during a game. How, then, it was possible for Roenicke to mess this up is beyond me. But rarely do you see a loss traceable so directly and tangibly to mismanagement. 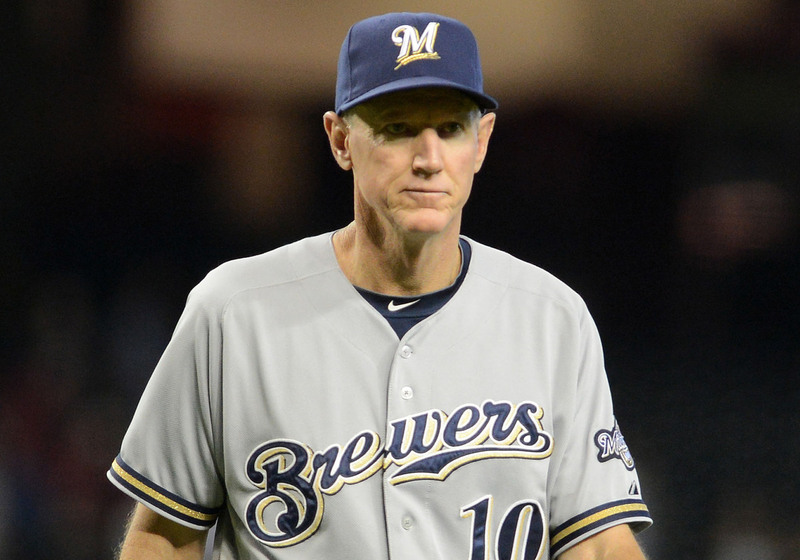 After the game, Roenicke said the loss was “going to be hard on me.” It should be. Let’s get this out of the way: Khris Davis had a crappy homestand. I get that going 0-12 while only reaching base twice isn’t going to woo many fans. It’s not like anyone else was knocking the cover off the ball during that homestand either, though. Let’s not close out the book on Davis quite so fast. 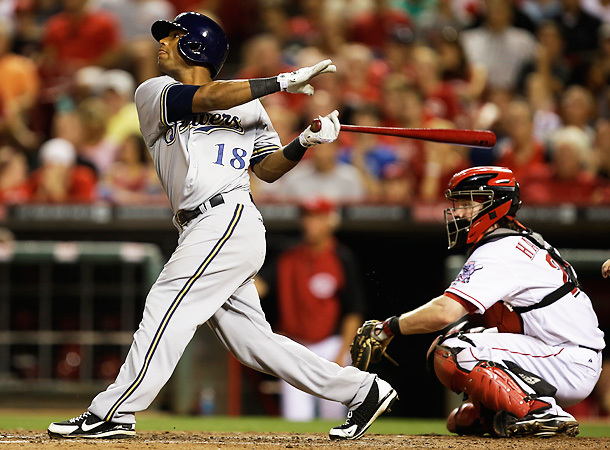 While Davis is now only slashing .250/.278/.346 on the year, he was key during the Brewers’ nine-game win streak, batting .343/.343/.486 with 8 runs. Davis hasn’t yet hit a home run. I understand that’s mildly concerning since power seems to be his one plus tool, and Davis certainly showed it last year with 11 home runs over 153 plate attempts. Extrapolating that out over a full season would have Davis hitting over 35 bombs, which I think we all know is pretty unreasonable. Part of the problem is Davis’s aggressiveness; last year, he was one of the ten-worst left fielders in swinging strike percentage among those with at least 150 plate attempts. He’s going to be a strikeout-prone batter. It isn’t that he’s swinging at bad pitches, necessarily, but he’s seeing many more breaking balls so far, as pitchers have figured out that Davis feasts on fastballs. Davis’s contact rates across the board this year are pretty abysmal; it’s clear there’s going to be a period of adjustment. Even if that’s a slow process, the home runs will come. Davis has hit just eight fly balls this year, so its way too soon to start worrying about the power. To some extent, I think the concerns about Davis stem in part from his performance in front of home fans, as he doesn’t have a hit at Miller Park but is slashing .406/.406/.563 on the road. So no, I’m not worried about Khris Davis yet. .250 is probably about right for his average, he’s never going to have a huge walk total, and the power will likely come, particularly in hitter-friendly Miller Park. But have they been overused, as some seem to think? Probably not. The Brewers ‘pen has tallied 32.2 innings, the 10th most-used bullpen in the National League and 18th in all of baseball. Relievers for five teams have pitched over 40 innings, and another five are pretty close. The Brewers seem to be pretty middle-of-the-pack as far as bullpen usage goes, and they’ve certainly been much more effective than even many less-used bullpens. What about individual players? Not much to worry about here either. Tyler Thornburg is on pace to throw 100 innings; Thornburg tossed 130 last year between Nashville and Milwaukee (and was great in his final starts for the Brewers). Will Smith (6 IP) is on pace for 88 innings. 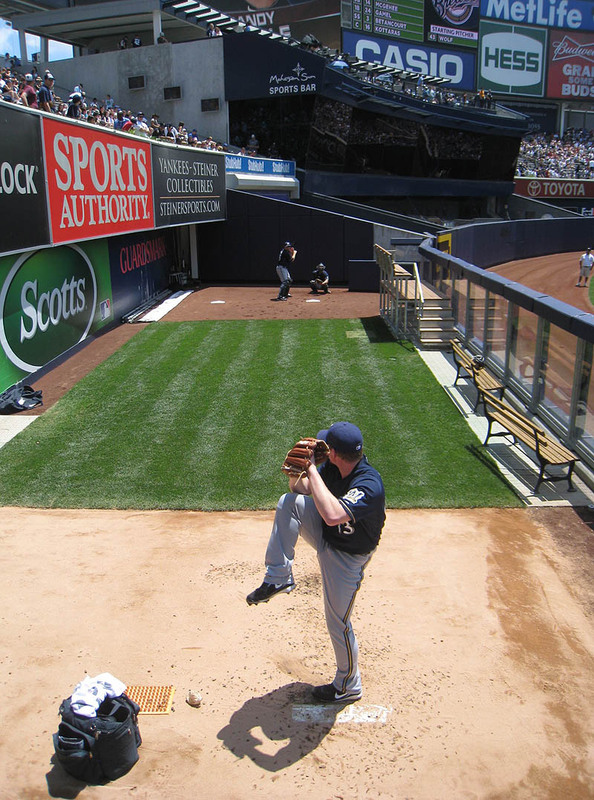 Smith pitched 89 minor-league innings and 89 major-league innings in as a starter 2012, and a total of 122 innings between levels last year. Henderson (4.1 IP) is on pace for 60 innings and pitched 60 in 2013. The one guy who is even remotely worrisome is the closer, K-Rod (6 IP), and he’s simply had more work lately because, well, the Brewers are winning lots of games. That’ll even out over time. In essence, this is a bullpen that can handle a bigger workload. It’s not like there’s a shortage of arms, either. The Brewers haven’t even used Wei-Chung Wang, a lefthanded Rule 5 pick from the Pirates. And *here’s the news* Brandon Kinzler has landed on the DL with a rotator cuff strain, and Rob Wooten has taken his place. It sounds like Kintzler’s injury is relatively minor but lingering since spring training. At least we won’t have to worry about him racking up more innings, I guess. Although people complain about the starting rotation’s failure to pitch deep into games, it seems to me they’re doing exactly what they need to be at this stage of the season. Here’s the number of innings each starter has pitched in every game during the win steak: 5.2, 5, 6.2, 5, 6, 6, 7, 6. I can’t see much wrong with that in early April.